Today I would like to introduce everyone to a phenomenal person and author, Makaya Vista. She is truly an inspiration to not only me, but everyone she comes in contact with. She will be your biggest fan, your toughest coach, and your truest conscience. Her books are making waves with readers young and old and I wish her the brightest future. Basically, I guess I began ‘writing’ as soon as I learned to print letters. I love words, putting them together and seeing my thoughts on paper, playing with word combinations, word play, describing things as I saw them, or how things made me feel. Maybe writing things down was my effort to try to explain further even though I rarely shared what I wrote back then. Writing is fun, relaxing, exciting, interesting, healthy and enlightening. Writing is also a way to interpret or express something including frustrations, elations, injustices, or sorrows; the writer directs the twists and turns, adds satire, humor, mystery, suspense, or gives credence to an idea or story. I love writing poetry and relate it to black and white photography. Some see it as black OR white, when in actuality it offers more depth than a color photo in many ways with its shades of gray and contrast; it has more feeling. Speedwriting is a way of unloading, clean up my internal hard drive, so to speak, to make room for more. Writing children’s books, for me, was more of a challenge to keep with the age, not be boring, be funny, make the reader think, offer something to learn and promote discussion and interaction. Peak-n-Boo helped to make this easier for me as they were the perfect subjects with a story to share. You have done all the editing and illustrations for the Peak N Boo series. Was that your plan from the beginning? I actually sent out test copies of my Peak-n-Boo stories to several friends and invited a couple groups of children to read the stories aloud to each other. This feedback was most helpful to me – what flowed well, or stumbled, and where there were questions and humor. It was great to hear children explaining parts of the stories to each other. I liked to watch the children work to get all correct on the reader quizzes at the end of each story. If a question came up, they’d search the book to share the correct answer. The smaller children, though not reading yet, stayed involved commenting on the illustrations and the expressions on the dogs’ faces. All of this was very valuable feedback. What inspired you to write about Peak N Boo and were they always meant to be children’s books? The Peak-n-Boo books began as experimental educational tools or aids for the children I was tutoring at the time. As my leukemia was demanding more medical attention, my immune system would require me to be more cautious around crowds and children I wanted to continue to help in some way. The Peak-n-Boo stories were initially mean to help the children with reading and memory skills, while offering insights into some dog behaviors. Some of the younger children expressed fear of dogs and didn’t understand why the dogs approached them, and sniffed at them as they arrived. Peak was newly rescued, and with Boo a natural mentor, they offered natural educational experiences for the children. The first story, Dreams Can Come True, shows Boo, the natural mentor helping the puppy, Peak, gain confidence, trust and learn that differences were positive, as was patience and love. The Treadmill Rules, the second Peak-n-Boo book continues the lessons of patience, as well as learning from one’s mistakes and not giving up when mistakes are made. Special Delivery shows Peak grown into a beautiful confidant dog. Though her body has grown up, Peak was still young and impetuous and lacked experience. Would she put herself in danger without thinking? Would she continue to listen and learn from Boo? Peak and Boo are rescue pups that have found a warm, loving home with you. Can you tell us more about them and their personalities? Boo had a very rough start. When she was first rescued they had very little hope for her. She came into my life when she was 8 months old a few days after she’d been rescued. For some unknown reason, the people who had her kept her in a wooden box “dog house”. It was too small for her growing body. As she had not been able to fully stand up in the box her bones did not develop correctly. When rescued she was also malnourished and weak. I was asked to meet her and to offer some comfort care such as massage, Reiki and T-Touch. Boo’s eyes showed life even if somewhat dim at that time. I let her know that I would shower her with love and care. She was very shy and frightened of her own shadow. Every sound or the slightest move of hand sent her cowering behind furniture, or struggling to get behind the toilet or under a bed. Before Boo was able to eat by herself, I sat on the floor with her offering her food from my hand. No matter the type of bowl or where I put it, initially Boo was afraid of it. She was unstable and easily fell over. She slowly began to gain some strength and within a couple months another veterinarian did X-rays to find a prognosis for Boo. She told me Boo would require several corrective surgeries to allow her better mobility and ability. I was fortunate that the veterinarian was remodeling her clinic. She offered me a deal – a trade for the Boo’s surgeries – my artwork for her clinic walls. Following her surgeries Boo would require strengthening exercise to build muscle. One way was to swim; the other was walking on an incline. At the time we lived near the ocean. With life-vest on Boo loved to swim. When we moved to the desert Boo took to the treadmill immediately. She seemed to instinctively know it was good for her. When she wants to walk, she will stand on the treadmill and wait for someone to turn it on for her. She also uses the treadmill to walk off anxiety as needed during a thunderstorm. Boo later went on to pass with flying colors, her classes in ‘good citizenship’, training as a service dog and has been registered with Therapy Dog International for going on 8 years. 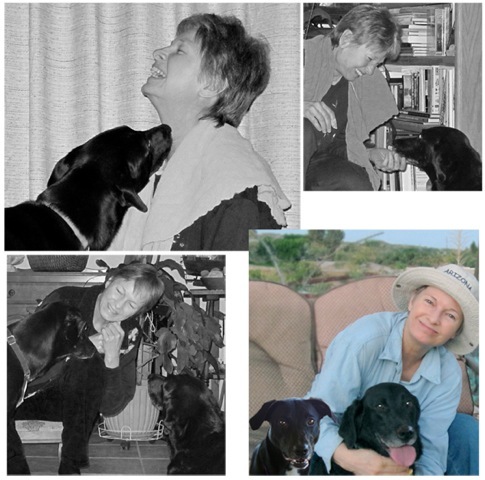 She has made hundreds of visits to nursing homes, hospitals, to visit shut-ins, children and families that have lost a pet, veterans and soldier dog handlers, and has consistently shown great empathy toward other beings. Peak was much younger than Boo when she first came into our lives. She’d been found on the outskirts of our desert town. She was alone, hungry, had injuries, was parasite ridden, and her fur was blotchy, dry and dull. Like Boo, Peak had no socialization skills; she suffered from fear-aggression that could be a very dangerous situation for a dog and those who might encounter her. Boo seemed to understand that Peak was in great need; she showed a natural empathy toward Peak. They really bonded well from the beginning. Both had been considered either un-adoptable or at the low end of adoptable. As with Boo, I could see life and a great desire to thrive in Peak’s eyes. Peak is amazingly smart and has a great desire to please. She has also grown into quite the jock, and is very the athletic. She loves to run; she will pump out another mile or so on the treadmill almost daily even after a long day of play outside. As Boo has gotten older, she has slowed down. It is very heartwarming to see Peak lie by her side and lick her face to console her loving mentor. She let’s Boo know that she loves her. Peak has also become protective of her home and family, and both dogs show tremendous gratitude. Each of the books has an activity section at the end. How important is it to you to include educational material with your writing for children? Do you witness the benefits from such writing? The quizzes at the back of the books were always a part of the books. When tutoring the children I’d always finish up the sessions with a few questions about what we’d covered to check their retention. I loved how the children like answering the questions, and how thrilled they were with each correct answer. The children were also working with homonyms and other word forms. I like to incorporate various areas in learning sessions; I like to encourage the children to think, and to figure out things. I noticed the children responded well to the quizzes and would try to out-guess each other, as well as explaining various words to the younger children. That is also why I added the bonus comic strip in the back of the second and third books with another quiz. I like word play and the Peak-n-Boo books offer many variations. Hint, I’ve noticed that children do better on the quizzes than adults. There is no question that you are a strong advocate for “giving back” to multiple causes. Tell us how the Peak N Boo series falls into this. As mentioned above, the Peak-n-Boo books help children with reading skills and memory but also, it is important that I get the message out. Teaching young children how to safely and gently interact with pets and animals is necessary for the safety of the child and the animal. I think when children understand the behaviors of animals, specifically dogs in the case of Peak-n-Boo; harm to or from animals is less likely. My goal with the Animal Protector Patrol is to teach children safe, positive interaction with pets. As animal abuse by younger and younger children is at a critical stage in our country and children that get bit by animals continues to happen, this is a problem that needs continued attention. A parent may not think it is necessary as they do not have pets in the home, but children will encounter animals. Their friends may have a pet or grandma may have a small dog or cat. Children need to know different animals act differently, and pets of different ages and varying situations may bring about differing reactions from the animals. An animal that is afraid or injured gives signals that a child needs to learn at an early age. Children need to know that harming a pet is not acceptable; that pets feel pain and they too have good days and they have times when they want to be left alone. Children need to learn there are appropriate ways to meet an animal and that animals have their own ways to greet people, children, babies, and other animals. They need to learn what not to do when around pets, especially dogs. A dog may run after a child that is running and screaming not knowing that the child is not trying to instigate play. Also it is important not to bother a dog when it is eating, or startle an animal when it is sleeping. Do you currently do any book signings and where can folks find your wonderfully heartwarming books? Do you Facebook or Twitter? Saturday October 29, 2011, I will be speaking at our local library as part of the Hassayampa Writer’s Club’s annual Celebration of Books presentation. Next month, November 12, 2011, I will again be at our local library as part of an author presentation series. I plan to speak about my Peak-n-Boo books though the bulk of my presentation will be interactive and will address animal protection. It will be geared toward small children and their parents. I will offer several of my coloring/activity educational aid illustrations to hand out to the children. The question and answer portion will be a group activity to encourage the children to share their thoughts and express any questions or experiences they may have had with pets and animals. My author website is http://animalprotectorpatrol.com/ and my Facebook fan page is located here. What is next for Peak N Boo? Will there be more adventures for this duo? Do you have any other projects in the works? I do have other Peak-n-Boo stories in the works, but honestly have put most of my efforts in the Animal Protector Patrol educational aids. This is an area I am very passionate about. Stopping animal abuse and educating children on appropriate interaction with pets is of the utmost importance to me right now. I currently have dozens of coloring/activity illustrations to encourage discussion and interaction. Hopefully these will get put together in booklet forms to assist as teaching aids for educators. My work encourages the children to share what they know, and to interact with each other, parents and educators. As ASU professor of social work has shared with me personally, animal abuse is on the increase, and is being committed by younger and younger children, even little girls, previously rare. What advice would you offer aspiring children’s book authors or writers just starting out? Write about something you know, something you are passionate about. Most children’s writers do not illustrate their own books. In my case, the illustrations and facial expressions of Peak and Boo are key to the stories. I had not planned to be an illustrator, or a writer of children’s books for that matter. It really snuck up on me. I was trying to figure out a way I could continue to work with the children I’d been tutoring while I would need to deal with cancer and treatments. The books also became a tremendous healing tool for me personally as they kept my mind off what I was going through and gave me a sense of purpose. I needed to heal, get well and continue – I have work to do.